In 2008, CLI supported the efforts of the Greater Caddo Lake Association, Cypress Valley Navigation District and others to construct an experimental barrier and implement a collection program at Caddo Lake. 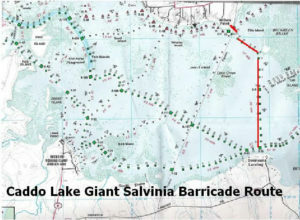 The barrier was constructed for 2 miles across the lake by volunteers who then collected the giant salvinia that was trapped by the barrier daily. During a storm in 2009, the barrier was damaged and, by then, giant salvinia had begun to be widespread in the lake. It was, therefore, removed rather than repaired. Additional information on Caddo Lake and its watershed can be found on CLI’s data website – www.caddolakedata.us.